Start out right! On anything from fast group rides to daily commutes, the new Synapse’s light weight, comfortable sportive position and smooth ride will help you ride faster, ride longer and ride more. The new Synapse is designed with with two different fork rakes - 60mm for smaller sizes and 50mm for larger sizes - for more consistent “trail” measurements and more consistent handling across the sizes, and reduced toe overlap on small sizes. Women’s saddles, narrower ergonomic bars with improved lever reach, and shorter crank lengths make your bike ride and fit better. FRAME: NEW Synapse Disc Women’s, SmartForm C2 Alloy, SAVE PLUS, BB30. FORK: NEW Synapse SAVE Disc Asymmetric, Carbon blades, 1-1/8” - 1 1/4” Tapered Steerer, flat mount, 50mm rake (44-51), 60mm rake (54). RIMS: RD 3.0 Disc, 28-hole. HUBS: Formula DC-1420 front, DC-1422 rear. CRANK: FSA Omega, BB30, 50/34. CASSETTE: Shimano HG500, 11-34, 10-speed. FRONT DERAILLEUR: Shimano Tiagra, braze-on. 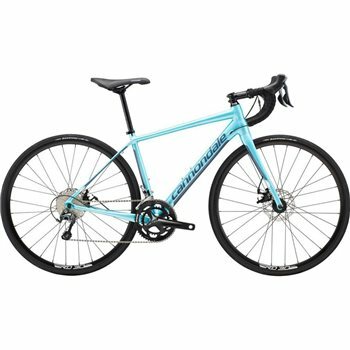 HANDLEBAR: Cannondale C4 Compact, 6061 Alloy. HEADSET: FSA Integrated, 1-1/4” lower bearing, 25mm top cap. BRAKES: Promax DSK 718R, Dual side pull, flat mount, cable disc, 160/160mm. SADDLE: Cannondale Stage Ergo Women’s. SEATPOST: Cannondale C4, 6061 Alloy, 25.4x350mm.